The staff there can answer all questions regarding uniforms. Required items for Pack 527 are in orange below. The Pack periodically conducts a Uniform Inspection in conjunction with a Pack meeting. The inspection forms that will be used are attached below. Points will not be deducted if your Scout does not have one of the optional items. The Class B uniform consists of our unit T-shirt along with whatever else the scout wants to wear. They may wear their belt and beltloops with the Class B. The Bobcat badge is the gateway to Cub Scouting because it is the first rank earned by every boy in Cub Scouting regardless of when he joins. It teaches the boy the fundamental ideals and values of the Cub Scout Program. 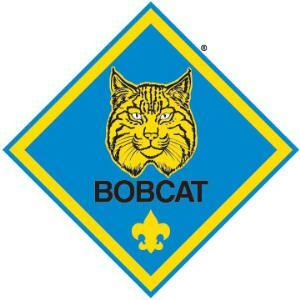 All boys will first work on their Bobcat badge to complete the Cub Scout joining requirements. Once the Bobcat badge requirements have been completed, the Cub Scout will continue with the age appropriate program.